Blaming mainstream politicians for the prevailing "political uncertainty and chaos" in Jammu and Kashmir, the Hurriyat Conference chairman asked Abdullah to revisit annals of history. 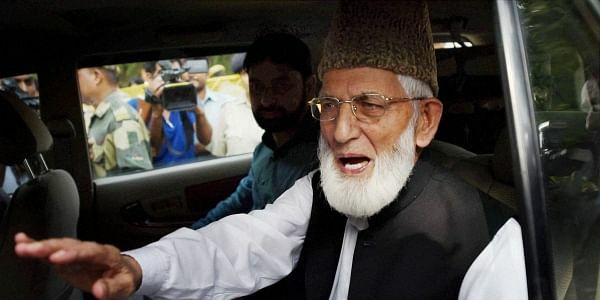 SRINAGAR: Hardline separatist leader Syed Ali Shah Geelani today slammed National Conference president Farooq Abdullah for dismissing talk of an independent Kashmir, saying "power-hungry" politicians have always "played deceit" with people. "These power-hungry politicians always played deceit. These irresponsible and short-sighted people have always served the interests of their masters. They are barefaced, follow their treacherous politics and are never ashamed of their absurd statements," Geelani said in a statement here. Abdullah, who is an MP from Srinagar, had said yesterday that talk of an independent Kashmir was "wrong" as the Valley is landlocked and surrounded by three nuclear powers -- China, Pakistan and India.